How does a ton of channels delivered straight to your TV for free sound? Pretty amazing, right? It’s actually not that difficult to do with a TV antenna. Yes, what’s old is new again, so get those bunny ears out and get ready to save yourself a ton of money. It can be frustrating if you just want to watch TV, but you don’t have enough juice. You have an outdoor antenna, but you just struggle to get reception. Of course, you could opt for cable or satellite but who wants to waste money on what you can get for free, right? Does this sound like you? This problem can be solved by spending some more money on a TV antenna and replacing the old one that you have. Now, let’s get into the details about each of these points to help you get the best TV reception possible for your specific situation. Keep on reading to find out more about improving your TV antenna reception. Your first move should be to boost the signal that you are getting. You can easily install this onto your TV via a USB port. This will help you get the highest range possible that your antenna is rated to. This will hopefully lead to clearer audio and video. Do you have any recommendations for a signal booster? That’s a great question and we’re happy you asked. Next, you’ll want to carefully consider the placement of your TV antenna and think about whether or not there’s a better location for it. This simple move can save you a ton of money, so it’s worth experimenting with it first before buying anything. Move it to another side of the house, or a different spot on your roof. Have someone inside the house telling you if the signal strength gets better or worse on your TV. And many modern antennas have indicators as well. Generally, the higher the better in a situation like this because there’s less interference. Also be sure to change the direction of it. It could vary depending on your location where it’s connecting to and which direction is the best. Another tip is to make sure there isn’t a lot of metal near your antenna which can interfere with it. For example, don’t place it next to an air conditioning unit, or your home security cameras! If you can’t go outside, or on your roof, then place it near a window or under a skylight. Thick walls will hinder your signal significantly. In order to know where to point your antenna, find out where the broadcast towers are that are closest to you. You should ideally do this before buying an antenna because you’ll need to know the range that you should be buying for. You can use these two websites to help you out: TVFool.com + AntennaWeb.org. Either of them allows you to input your address and then you’ll see a map that outlines the distance and direction of the broadcast tower. If you have a wireless antenna, it may not work that well with other wireless devices around such as your Internet router. Consider a wire based antenna if you have a Wi-Fi network set-up. Another problem may be multiple antennas in the same vicinity. This is especially a big problem in crowded urban areas. It slows down the transmission of TV signals because it has so many roadblocks in the way. Unfortunately, there isn’t really anything you can do about this. 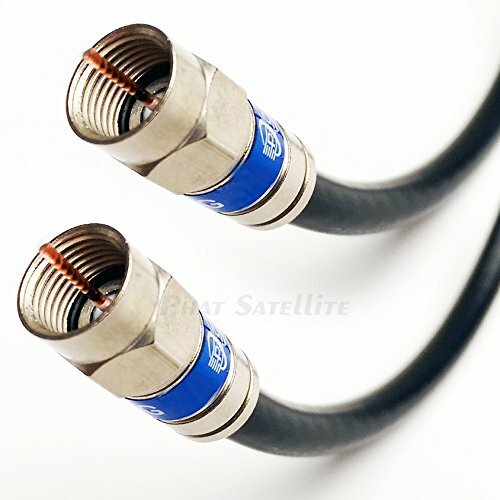 More coaxial cable may help you to boost your antenna signal. More cable means more freedom to place the antenna wherever you want to. It can make a huge difference, especially if you place your antenna higher up. Compare the reception you get in your basement compared to the roof of your house if you don’t believe us! In some cases, it may be the cable itself that’s causing problems. If you’ve tried the other solutions, but they didn’t work well for you, consider upgrading your cable to RG-6, which can give you more channels and better reception. This better shielded calbe can reduce electromagnetic interference and signal noise. There is a huge variation in the low-end and high-end TV antennas. Like a massive range and a poor-quality antenna may never get good reception, no matter what other things you do to improve it like finding a better location, or getting a signal booster. If you have an extra antenna laying around, it’s certainly worth a try. 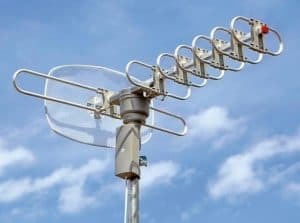 It can be a little bit tricky to get this up and running, but it may just be the solution you need to boost your outdoor antenna TV signal. Try placing one antenna facing towards the weaker broadcast tower and the other towards the stronger one. Then, couple the antennas together to get one stronger signal. Important note here: Use a coupler, not a splitter to do this. 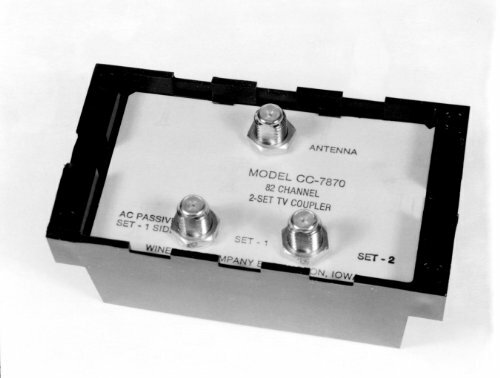 Winegard CC-7870 Antenna Coupler, 5.40" x 2.90" x 2.20"
Rescan for new channels periodically, especially if you did your first scan during poor weather or on a cloudy day. You may be able to pick up some new stations. In addition, stations sometimes relocate to different frequencies, or increase/decrease their transmission power. Be sure to follow the directions that came with your antenna. Sometimes mistakes in installation can cause these devices to not work as well as they should. It’s not difficult to install them, but you can certainly make some mistakes. What About Analog vs Digital TV Signals? In a world with identical broadcast condition, a digital TV signal won’t travel as far as analog. This is because things like roofs, trees, hills and wind affect digital signals more. It’s actually so sensitive that someone walking in front of it can make it go offline briefly. So why opt for digital TV over analog if the reception can so easily be hindered? Basically, digital TV is far superior in both quality and clarity. However, it may sometimes go offline if you have a weak signal. But, even if you have just a weak signal, the picture will still be sharp and clear. On the other hand, analog TV has a lower quality viewing experience, but a weak signal won’t cause it to go offline. At its worst, it’ll be snowy or grainy and not clear. What are the Benefits of Going with a TV Antenna Instead of Cable or Satellite TV? Okay, so you might be thinking to yourself, “Why bother with a TV antenna if reception isn’t great?” There are a number of reasons, but most importantly, you can save a ton of money. 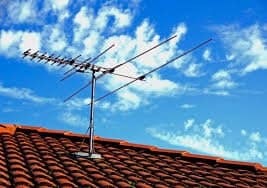 A TV antennas allows you to cut the cable and potentially save a ton of money in cable and satellite TV contracts. You won’t get as many channels, but if you don’t care about this, it can be an excellent solution. Combine this “free TV” with something like Netflix that is an Internet streaming service and you’ll probably have everything you could possibly want. In addition, you may get better picture quality. Beginning in 2009, on-air broadcasts are delivered in 1080P. However, cable and satellite providers often reduce the picture quality to save on bandwidth and the result is lower-quality HD. Finally, you can probably get most of what you want via antenna. Many live events and local sports are easy to pick. According to some estimates, almost 95% of top programs can be found for free. Why Not Opt for Just TV Streaming? Why not stick with something like Netflix or Hulu and take advantage of the Wi-Fi that you’re already paying for? It’s very reasonably priced and has a ton of content that you’ll probably enjoy watching. However, the main advantage to using a TV antenna and getting channels that way is for live events and sports. What’s your Top Pick for an HDTV Antenna? In general, we strongly recommend omnidirectional TV antennas. This means that they have the ability to get signals that are coming from any direction. Some of them rotate to achieve this, while others are just designed to get reception on all sides. The Best Omnidirectional TV Antennas. Do you have any tips or tricks for how to boost a TV antenna signal strength? Leave a comment below and let us know your thoughts.